I've made a model that creates some points with Z value and a buffer, which I then do a 3D analyst IDW on, and a Cut Fill analysis. 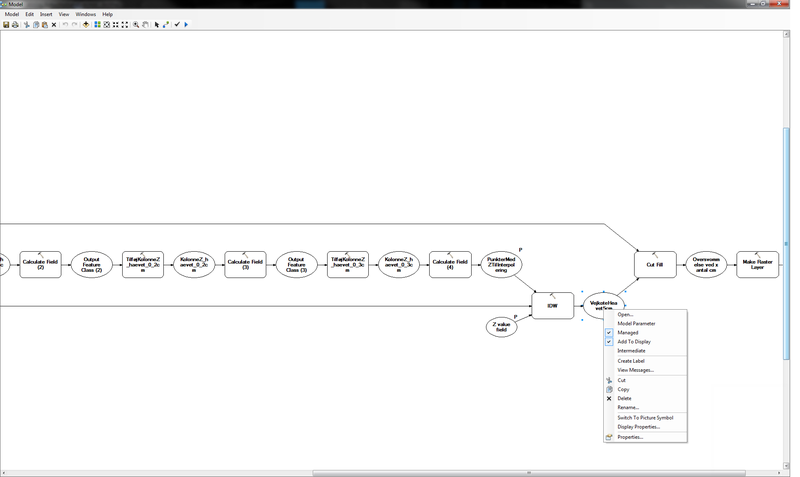 The model input is a line along with af DEM/Raster, and some names for the output files. However I would like to show the IDW output as a layer that will be opened in the Table Of Contents and displayed as well as the CutFill, but for some reason I can't get it to work. Answer: Adding a Make Raster Layer after the IDW output seems to do the trick as well. The answer is in the help file under the page title of Display model data, the note explains how to make it add to table of contents. Add To Display has no effect outside ModelBuilder. When running a model tool from its dialog box or the Python window, the Add To Display setting will not be honored. To add model data variables to the display when running the model from its dialog box or the Python window, make the data variable a model parameter, then enable the Add results of geoprocessing operations to the display option from the Standard toolbar: Geoprocessing > Geoprocessing Options > Add results of geoprocessing operations to the display. Not the answer you're looking for? Browse other questions tagged arcgis-desktop modelbuilder 3d-analyst inverse-distance-weighted or ask your own question. Inserting script into ArcGIS ModelBuilder?